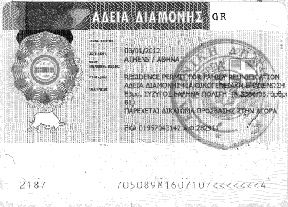 There are dozens of different work permits for Greece, and individuals who are high ranking professionals (directors, general managers, board members and administrators) at EU or non-EU companies abroad, with a branch or subsidiary in Greece are eligible for a visa and permit to live and work in Greece if their company transfers them. Permits are not granted to everyone, and I encourage all non-EU citizens interested in living and working in Greece to first read, “How Americans/non-EU citizens can move, live and work in Greece.” Why? Because it is of vital importance to understand the legalities of visas and permits before investing time in looking for a job or continuing to read this post. After your papers are verified and accepted, you will be issued a bebaiosi (certificate of receipt; blue paper with photo). It is not a permit. It simply means that papers have been received and you have temporary permission to stay while higher authorities examine your documents. You must carry this or a photocopy with your passport for public and private transactions, as well as legal purposes should a policeman or other authority ask you to present it. There is no interview or other requirement, but it is your responsibility to go in person to follow up on its status since no one will call or otherwise contact you. If your application is successful, a permit will be issued in the form of a sticker. Be sure to apply as early as possible upon arrival and after securing a legal residence, in case there are issues that need resolution. You must complete the process before the special entry visa expires. Be sure to apply as early as possible, in case there are issues that need resolution. You are expected to renew your work/residence permit at least 60 days before the current permit expires. It is your responsibility to keep track of date for renewal by looking at the date on the bebaiosi, even if your permit sticker or card hasn’t been issued.